As pet owners, it is our absolute worst when our precious furbabies get sick, nevermind the cost in vet bills (that is of course, if you don’t have quality cover in pet insurance from Oneplan), but the emotional stress alone is something no one should have to go through. That’s why we believe in knowledge as being able to know and learn about the common conditions and infections that are out there could help you in detecting the symptoms in your dog. "Parvo, which is short for canine parvovirus (CPV), is a highly contagious viral infection that affects our precious pooches. " The virus can form in two different forms, the more common of these is the intestinal form which has symptoms of vomiting, diarrhoea, weight loss and loss of appetite. The less common form of the virus is the cardiac (i.e. the heart) form which attached the heart muscles of young puppies (poor babies) and often leads to death. The majority of cases of parvo are seen in puppies between the ages of 6 weeks and 6 months old. Luckily, a lot of pet owners are now vaccinating their dogs which is slowing down the occurrence of the disease. 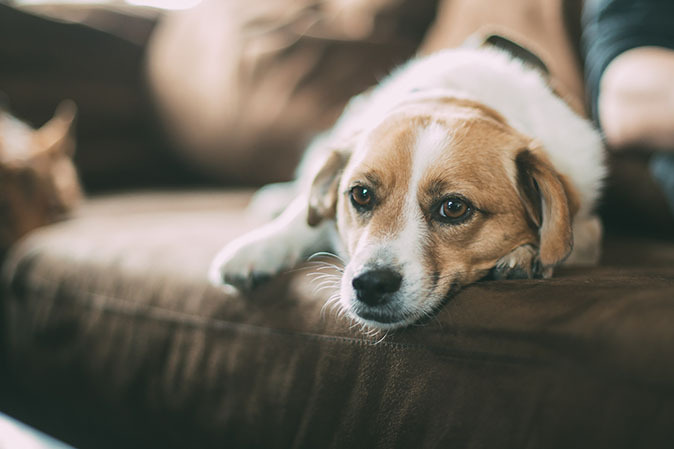 Basically what happens when your pooch gets sick is that the virus stops their body’s ability to absorb any nutrients, so they become incredibly dehydrated and weak. When your vet touches your dog’s tummy, this may result in them whimpering in pain. Their mouth and eyes will also become red and they may have a rapid heartbeat. They may also have an extremely low body temp as opposed to a fever. The disease is highly contagious and can be spread from any person, object or animal that comes into contact with the poop of an infected dog. The virus can live in the environment for months as survive on any objects such as shoes, food bowls, clothes and carpets. Your vet will diagnose the virus based on the symptoms your dog is showing and lab tests. Your vet will use a special test kit to diagnose your doggie in the vet’s rooms. Are certain dogs more prone to parvo? Make sure that your puppy is vaccinated according to your vet’s directions. Have a look at our guide to vaccinating your furbabies. The Parvo vaccination is seen as a core vaccine for your pooch. If your dog has come into contact with an infected dog, then you will need to wash him, his bedding, linen will all need to be cleaned in a bleach solution and soaked for 10 minutes as the virus is difficult to kill. The solution is made with 1 part bleach and 32 parts water. Sadly, there is no cure for the virus. Therefore, there are no drugs that can kill it as yet. But the treatment given by your vet will typically help your furbaby get back the health of his immune system through antibiotics, overnight stay for a week or less in hospital and other drugs to control the symptoms. Unfortunately, treatment is not alway successful. Home treatment is not recommended. If you notice some of the signs and symptoms of parvo in your dog, then make sure you get him or her to your vet immediately. If you are worried about vet’s bills, why not have a look at our range of pet insurance plans that promise to deliver in quality cover? Parvo, which is short for canine parvovirus (CPV), is a highly contagious viral infection that affects our precious pooches.